This decorative adjustable traverse rod comes with 26 slides. Rods are metal, slides and finials are plastic. Extra slides are available.Brass drapery rods are expensive, the Traditions gives you the brass look without the cost. Projection 3 1/2 to 4 1/2 inches. Spring pressure shower tension curtain rod 44" to 72"
Shower curtain rods. Drapery tension rods. Anodized aluminum finish. 44" to 72" Note: Super tension curtain rods for showers. Plated and painted with optional fixed brackets. Spring shower rod for your bathroom remodel. 12 foot fluted wood curtain rod 2 1/4 inch diameter. Decorative curtain rods for any window. Renaissance Collection by Design Elements. Bright brass finish, projects 3 1/2 to 4 1/2 inches, clearance 2 1/2 to 3 1/2 inches. 1 1/2 inch Windsor curtain rod. drapery hardware collection by Graber Rods are metal, slides and finials are plastic. Select color from drop down box. Base price is for first 3 feet. Set Includes assemble rod, standard wall 93139 or ceiling 93138 brackest and 9923 cord tension pulley. Rod may be bent or curved at additional cost. Sizes over 94 inches will have an oversize freight charge manually added. Notification of amount will be emailed for approval before shipping. Architects, interior designers and construction specifiers whose reputations ride on the products they recommend choose Kirsch. The pioneer of custom Architrac and industry leading drapery heading systems. Recognized for precisely engineered products that perform under demanding commercial, institutional and residential environments, Architrac provides a complete selection of custom hardware systems ready to install or adaptable to satisfy virtually any installation. Plus truck freight over 104". 1 3/8" heavy duty drapery hooks. 500 per box. Bulk pack for large users. See below for smaller packs. 1060-061: Pin on drapery hooks 3"
Regency holdback for draperies and curtains. Size 5 1/4 by 2 or 4 inch projection. Renaissance Collection by Design Elements. Select wood curtain rod pole 1 3/8" diameter, 12 feet long. Available in 4,6,8 and 12 foot lengths. Ten colors to select from plus unfinished. Base Price is for unfinished rods. Colors will show price in the cart. Note: 12' rods have to be shipped by truck. Lock-seam design gives the curtain rod additional strength for medium to heavy curtains. Made of .013 gauge steel that measures 3/4 x 3/8 inch, and is coated inside and out leaving no exposed edges. by Graber. Includes mounting brackets. Use for triple curtain treatments or double curtains with a valance in front. 4-275-1: Triple curtain rods 84"-120" by Graber"
Single lock-seam curtain rods 84-120" projects 5 1/2"
Projection, 5 1/2 inches from mounting surface. Graber lock-seam curtain rods are made of .013 gauge steel and measure 3/4 x 3/8 inches for extra strength. They are coated inside and out, leaving no exposed edges. For medium to heavy curtain fabrics. One per envelope. 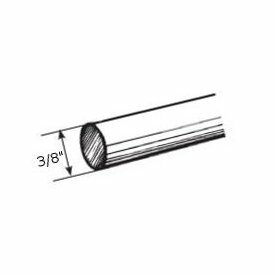 4-252-1: Single lock-seam curtain rods 28-48" projects 5 1/2"
4-253-1: Single lock-seam curtain rods 48-84" projects 5 1/2"
Made of vinyl coated fiberglass yarns. 5 percent openness factor makes this roman shade fabric perfect for windows that require more privacy. Comes in 72 and 96 inch wide fabric. Available in cut yardage or 30 yard bolts. Super heavy duty. White finish. Projection, 2 3/4 to 4 1/4 inches. Clearance 2 to 3 1/2 inches. Full pack price on 4 each. Graber super heavy duty features include a universal front loading end bracket, metal adjustable and reversible master carriers ball bearing end pulleys, a spring loaded side gate for adding or removing slides, molded, canted slides, can be converted to one way draw, scored center support base for easy mounting on narrow casings, universal cam lock stirrup, braided polyester cord, and angled tip on overlap arm. End cap finial for 1 inch metal curtain rods. 1 1/8 inches long by 1 3/4 inches wide. Made of cast iron. White finish fiberglass. For grommeted cubicle curtains or hand draw, pinch pleated draperies.